$5 Off Tickets to Disney Live! 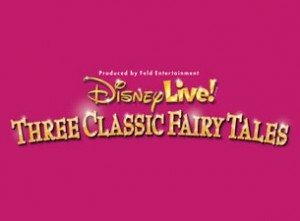 presents Three Classic Fairy Tales 3/16 & 3/17 (Chicago-Area) | A Savings WOW! Prepare to step into a world of wonder where wishing is only the beginning and dreams really do come true in Disney Live! presents Three Classic Fairy Tales. Join Mickey, Minnie, Donald and Goofy as they bring the timeless fairytale adventures of Cinderella, Beauty and The Beast, and Snow White and the Seven Dwarfs to life right in your hometown. Featuring dynamic storytelling, award winning music, stunning costumes and glittering special effects, audiences will be captivated by the humor, fun and adventure of these spellbinding stories. Dream with the princesses, cheer for the heroes as they conquer evil villains, and marvel as these classic tales are brought to life in a theatrical experience that’s pure magic. It’s playing the Akoo Theatre in Rosemont, IL from March 16th through March 18th. Get your tickets today! Disney Live! presents Three Classic Fairy Tales will be at the Akoo Theatre in Rosemont, IL from March 16th through March 18th. Ticket prices can be purchased through Ticketmaster. Purchase your tickets to Disney Live! presents Three Classic Fairy Tales today! Disclosure: We are Feld Family Ambassadors, and in exchange for our time and efforts in attending shows and reporting our opinions within this blog, as well as keeping you advised of the latest discount offers, Feld Entertainment has provided us with complimentary tickets to Feld shows and opportunities to attend private Feld pre‐Show events. Even though we receive these benefits, we always give opinions that is 100% ours. Please see our disclosure policy for more information.